Today's Dessert of the Day comes courtesy of Kelly White. Kelly has dropped three dress sizes, so it just goes to show, you can eat scrumptious food and lose weight. Not suitable if you are tea-total, and as it has uncooked egg, maybe best avoided if you are pregnant. Sprinkle the gelatine onto 4fl oz boiling water. Stir to dissolve and leave to cool. 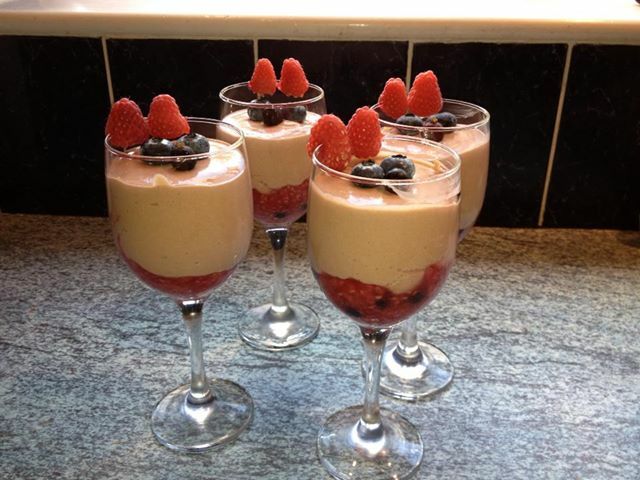 Retaining a few for garnish, lightly crush the raspberries and divide between 4 dessert glasses. Sieve the cocoa into a bowl with the High Lights, sweetener, fromage frais and vodka. Mix until smooth. Add the cooled gelatine to the mixture and stir well. Whisk the egg white until stiff, then fold carefully into the chocolate mixture with a metal spoon. Divide between the dessert glasses and chill for 2-3 hours until set. Garnish with the reserved raspberries and a few blueberries. You can freeze the delicious desserts, if you can resist them for long enough to get them into the freezer.